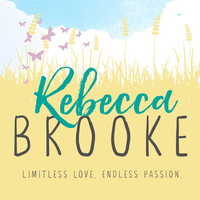 Rebecca Brooke is the author of the Traded Series, as well as other contemporary and paranormal books. She grew up in the shore towns of South Jersey. She loves to hit the beach, but always with her kindle on hand. She is married to the most wonderful man, who puts up with all of her craziness. Together they have two beautiful children who keep her on her toes. When she isn’t writing or reading (which is very rarely) she loves to bake and watch episodes of This is Us and Game of Thrones. I can't believe it's finally live! We’d love your help. Let us know what’s wrong with this preview of Wheels Up by Annabeth Albert. We’d love your help. Let us know what’s wrong with this preview of Finley by Ella Frank. Rebecca Brooke has read 2 books toward their goal of 36 books. We’d love your help. Let us know what’s wrong with this preview of Fissure by Nicole Williams.